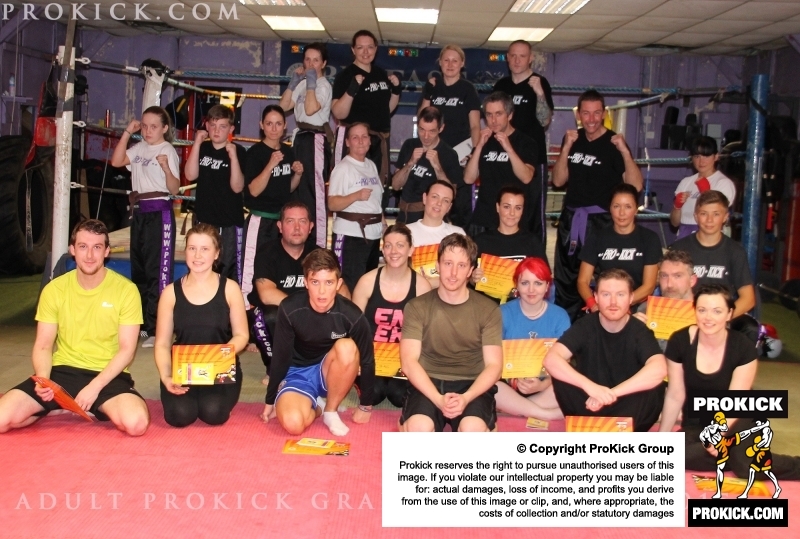 TODAY August 2nd 2015 Kickboxing enthusiasts were tested in the hope of moving to the next level at the ProKick Gym in Belfast. A few levels from beginner to senior Black belt level worked hard for months and in some cases years. Just a few beginners were invited to test for grades and move up the ladder of kickboxing excellence. Well done to all for doing a great job by obtaining your grading. A grading is when kickboxing students, non-contact and contact, are assessed through a series of levels/grades, with the base level being white belt, through ten levels, finally reaching a Dan grade at black belt, which is equivalent, if you like, to a degree level in kickboxing. Check-out are new elite ProKick Members with over 50 years of training between FIVE.